OKLAHOMA! [Piano - Vocal Score]. HAMMERSTEIN, Oscar. II. & ROGERS, Richard. SIRMAY, Albert ed. Williamson Music Inc. Paperback. 4to. Oklahoma! Is a complete piano-vocal score of this ever popular musical. Based on Green Grow the Lilacs, a stage play by Lynn Riggs. Music: Richard Rodgers, Lyrics & Book: Oscar Hammerstein II. Front cover has penned name & tape mark, light bump to top of spine and top corner, a little pencilling, some dog-eared pages, o/wise good. 208 pp. .
PIANO-VOCAL SCORE. HAMMERSTEIN, Oscar. II. & ROGERS, Richard. SIRMAY, Albert ed. Williamson Music Inc, n.d. Paperback. Folio. Oklahoma! Is a complete vocal score of this ever popular musical. Based on Green Grow the Lilacs, a stage play by Lynn Riggs. Music: Richard Rodgers, Lyrics & Book: Oscar Hammerstein IIThe plot is simple, revolving mainly around the question of who will take Laurey Williams to the box social--the decent Curly McLain or the sinister Jud Fry. A little wear to spine, a little pencilling, prev. owner's stamps to covers and inside front cover and titlepage, otherwise good. 208pp. .
Williamson Music Inc, N.D. . Paperback. Folio. Oklahoma! Is a complete vocal score of this ever popular musical. Based on Green Grow the Lilacs, a stage play by Lynn Riggs. Music: Richard Rodgers, Lyrics & Book: Oscar Hammerstein IIThe plot is simple, revolving mainly around the question of who will take Laurey Williams to the box social--the decent Curly McLain or the sinister Jud Fry. A little wear to spine, prev.owner's names to cover and inside cover, several marks to covers, otherwise good. 208pp. .
Williamson Music Inc, n.d. Paperback. Folio. Oklahoma! Is a complete vocal score of this ever popular musical. Based on Green Grow the Lilacs, a stage play by Lynn Riggs. Music: Richard Rodgers, Lyrics & Book: Oscar Hammerstein IIThe plot is simple, revolving mainly around the question of who will take Laurey Williams to the box social--the decent Curly McLain or the sinister Jud Fry. Some wear to spine, prev. owners's stamps to covers, inside front cover & titlepage, otherwise good. B/W music score & Lyrics. 208 pp. .
Williamson Music Inc, n.d. Paperback. Folio. Oklahoma! Is a complete vocal score of this ever popular musical. Based on Green Grow the Lilacs, a stage play by Lynn Riggs. Music: Richard Rodgers, Lyrics & Book: Oscar Hammerstein IIThe plot is simple, revolving mainly around the question of who will take Laurey Williams to the box social--the decent Curly McLain or the sinister Jud Fry. A litle wear to spine, previous owner's stamps to covers and titlepage, o/wise good. Piano vocal music score & Lyrics. 208pp. .
Williamson Music Inc, N.D. . Paperback. Folio. Oklahoma! Is a complete vocal score of this ever popular musical. Based on Green Grow the Lilacs, a stage play by Lynn Riggs. Music: Richard Rodgers, Lyrics & Book: Oscar Hammerstein IIThe plot is simple, revolving mainly around the question of who will take Laurey Williams to the box social--the decent Curly McLain or the sinister Jud Fry. A little wear to spine, small stain to top edge of first few pages, otherwise good. 208 pp. .
OPEC and the Third World: The Politics of Aid. Croom Helm, 1984. Hardcover. Condition vg in dj. 320pp. ISBN 0-7099-3707-5. .
OPEC and the Petroleum Industry. Croom Helm, 1976. Revised edition. Hardcover. Condition vg in dj. 194pp. ISBN 0856642622. .
Oberto Conte di San Bonifacio. A Drama in Two Acts. Edwin F. Kalmus. . Paperback. 4to. Slight wear to covers, otherwise good condition (no markings to score). In Italian only. Piano vocal score. 231pp. .
Obesity: Comparative Methods of Weight Control. Technomic Publishing Co., 1980. Hardcover. Good condition. No dj. 192pp. ISBN 0877622612. . Object Carpet Fantasy: Bilder Mit Teppichboden. Object Carpet GmbH, n.d. (c.1993). Hardcover. Folio. Very good condition. Photo mounted to front cover. No dust jacket. B/W & col. photos. Includes the work of photographers Michel Comte, Helmut Newton, Jean-Baptitste Mondino etc. Text mainly in German with some in English. 148pp. .
University of Toronto Press, 1973. 1st edition. Hardcover. Good condition in price-clipped dj. Combats the widespread opinion that objective inquiry is impossible in the social sciences by drawing together & portraying the weaknesses of arguments, taken from positions in the philosophies of science, language, & perception, in favour of anti-objectivism. 154pp. Rare. . The Objectives of the U.S. Information Agency: Controversies and Analysis. Frederick A. Praeger, 1969 (1966). Reprint. Hardcover. Ex-library, bump to bottom of spine, some fraying to bottom of spine, some rubbing to covers, otherwise good (no markings to clean text). No dust jacket. 251pp. .
Routledge & Kegan Paul, 1986. Hardcover. Spine of dj sunned, o/wise good condition. 124pp. ISBN 0710208979. . Objectives and Perspectives in Education: Studies in Educational Theory (1955-1970). Routledge & Kegan Paul, 1972. Hardcover. Ex-library, spine of dj sunned, o/wise good (no markings to text). 272pp. 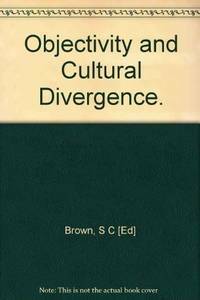 ISBN 0710072473. .
Cambridge University Press, 1984. Paperback. Prev. owner's name to title-page and bottom edges, o/wise good. Part of the Royal Institute of Philosophy Lecture Series: 17. Scarce. Out of print. Explores the following questions: Is there a common human nature? Is criticism of another culture or society no more than an assertion of the values and perspectives of one's own? Should relativism be admitted and objectivity correspondingly limited in some areas of inquiry and human interest? 262pp. ISBN 0-521-26940-7. .
Objectos Naturais: Metamorfoses da raiz, caule e folhas / Natural Objects: Metamorphosis of root, stem and leaves. Museu e Jardin Botanico da Universidade de Lisboa, 1999. Hardcover. Oblong 4to. Text to accompany an exhibition. In Portuguese and English. Colour photos and illus.Slight rubbing to rear cover, otherwise good condition. ISBN 9729649111. . 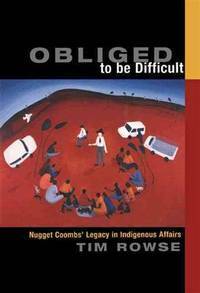 Obliged to be Difficult: Nugget Coombs' Legacy in Indigenous Affairs. Cambridge University Press, 2000. Hardcover. Condition vg. No dj. 254pp. ISBN 0-521-77353-9. .
Macdonald & Jane's, 1977. Hardcover. Ex-library, o/wise good (no markings to text) in dj. B/W plates & illus. Music exs. Part of the Yehudi Menuhin Music Guides series. 236pp. ISBN 0356084167. . Obscenity and Public Morality: Censorship in a Liberal Society. The University of Chicago Press, 1969. Hardcover. Ex-library, o/wise good (no markings to text) in dj. 315pp. .